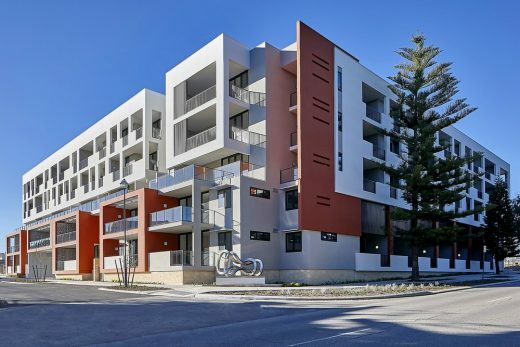 The Pocket is the first completed development at Claremont on the Park, a new residential precinct created around the Claremont football oval. 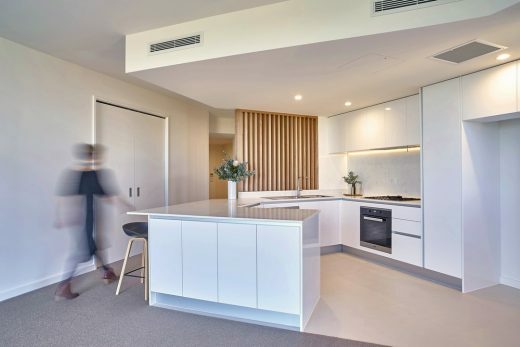 The Pocket brings together many of the design principles our practice has developed over the last five years into a well-resolved and highly functional apartment complex. 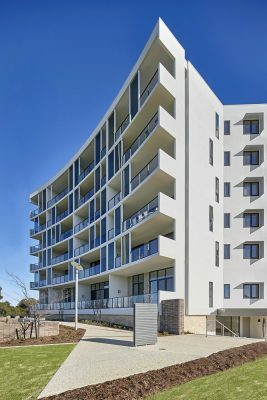 The Pocket features 95 apartments across 5 and 6 storeys, and offers a diversity of apartment types in one-, two- and three- bedroom configurations to accommodate different lifestyles and budgets. A vertical village built around a central communal courtyard, the focus is on amenity. The Pocket is positioned in direct proximity to transport, shopping, entertainment, and sport and recreation facilities. This reduced the need for on-site facilities that would generate higher construction and operational costs, and reduces reliance on cars. For retirees in particular, these factors are highly desirable. 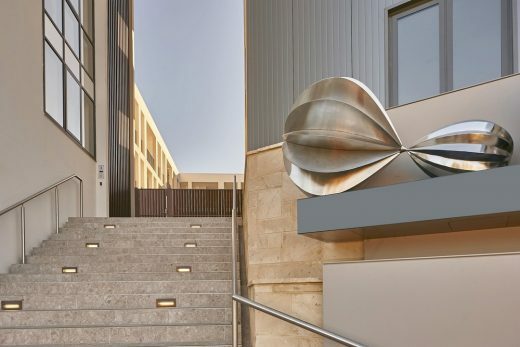 The design evokes a distinctly Claremont character, drawing cues from the limestone, terracotta and weatherboard buildings in the adjacent train station precinct. The subtly-raised ground floor balances privacy with surveillance of the public realm. 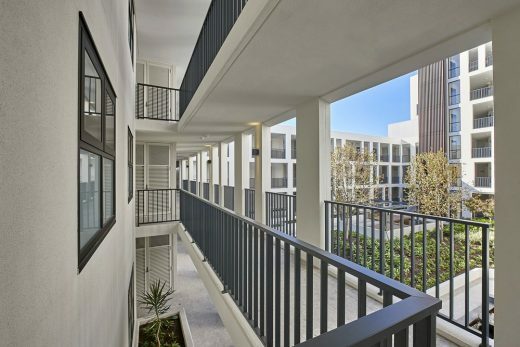 Upper floor apartments offer vistas to Lake Claremont and the Scotch College playing fields, whilst the oval side apartments have spacious balconies with spectacular views and dedicated lifts in keeping with their premium position. The Pocket features generously-proportioned public and private spaces. Circulation areas, such as foyers, corridors and walkways, are wide, and give high regard to privacy. Spacious bathrooms provide level access to showers. 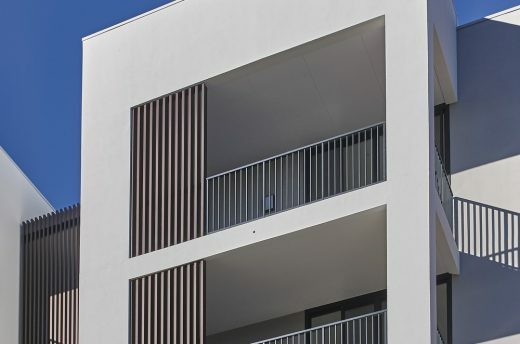 Condensers for air-conditioners are concealed, mostly within storage space immediately adjacent to each apartment. Balconies are sized for entertaining and offer passive surveillance on all building perimeters. Walkways are offset from the building mass to maximise air circulation and light penetration and increase privacy, and all parts of the building have courtyard and/or district views. This permeability creates an openness which belies the size of the development. An active ground-plane is encouraged through multiple entry points. 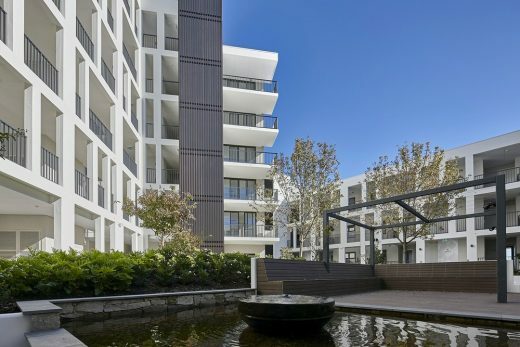 On Davies Road, double-height townhouses form a podium which creates a strong public interface. Entrance lobbies are designed to encourage exploration and discovery, leading to an oasis-like interior courtyard with lush landscaping and running water features. The serenity of this central space communicates a sense of quiet luxury commensurate with the location. Sustainable design initiatives include cross ventilation, appropriate sun shading, and double glazing, to provide comfort whilst minimising the need for mechanical cooling. A central gas water heating system and WELS-rated fixtures and equipment facilitate further energy savings. The Pocket was the winner of a competition run by LandCorp, the Western Australian government land and development agency. The scheme had to conform to strict design guidelines and urban design objectives, and meet commercial imperatives. It also had to deliver diversity in dwelling types. 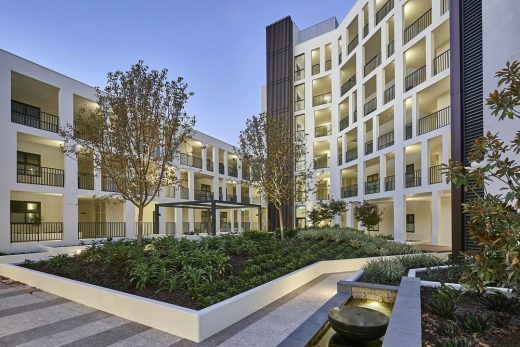 As the first project in Claremont on the Park, it was required to set a design and quality benchmark for future developments in the precinct. The unusual shape of the site resulted in a built form with five facades. The challenge lay in ensuring that each facade successfully addresses climate and public interface. Creating activated edges and passive surveillance on all sides, as well as appropriate scale, were design issues that required resolution, along with developing an architectural character in keeping with the location. In response to unique orientation, the facades are conceived as ‘open protective’ (north), ‘solid protective’ (west’), and ‘open-inward’ on the oval- facing facade. The north façade is five storeys, with a 3m setback above two storeys to respond to the townhouses opposite. 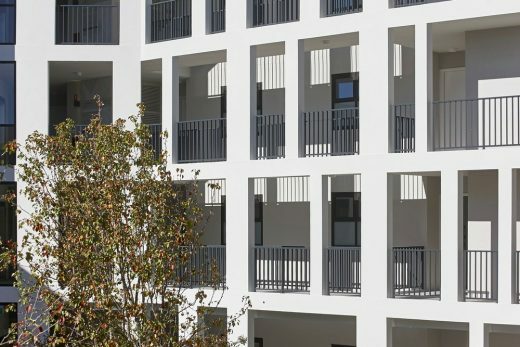 The west façade is also 5 storeys, with double-level townhouses at ground level to create a strong public interface along the main road and pedestrian route. The oval façade is 6 storeys, with returns along the east and south laneways. 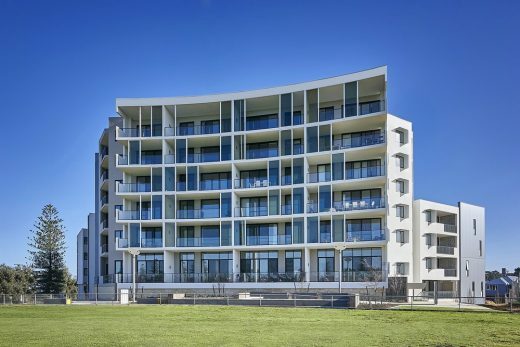 It follows the curve of the oval and has glass balustrades for uninterrupted views.